Nothing says love or celebration like a big bowl of creamy pasta (who’s with me?). 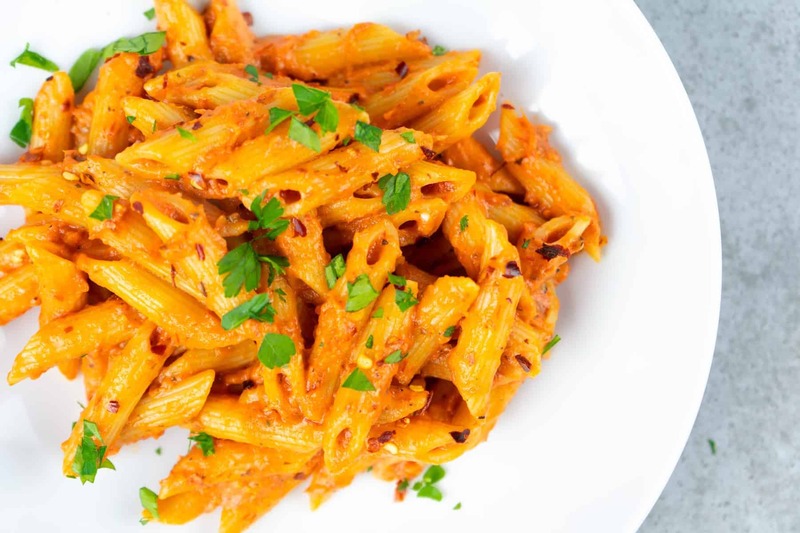 This Classic Penne alla Vodka is the recipe that I grew up on. And it remains a favorite, save-it-for-the-holidays dish that’s worthy of every fan-girl-moment it has received over the years. Penne alla Vodka is the dish that my mom would make on Christmas Eve when we got home from church. Her reasoning: “it’s so festive!” with its bright red sauce and green parsley garnish. And I would always be thrilled that’s what was on the menu. My reasoning: It’s spicy and creamy. The pasta’s always perfectly al dente. And it really does scream celebration. Which is why I’m finally bringing it here to the blog. 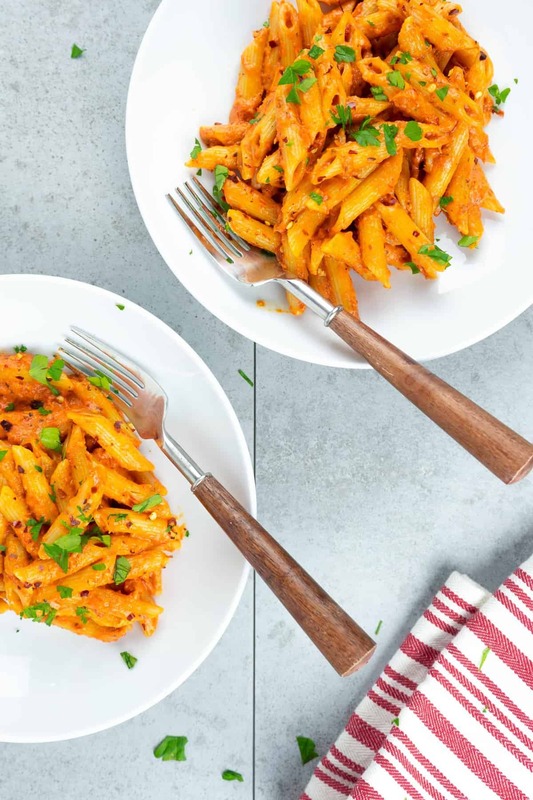 Whatever the reason may be: birthday, Valentine’s Day, date night, you have company, or just any old Tuesday, this Penne alla Vodka is an easy way to impress. Because there are so few ingredients, I highly suggest using the good ones here. 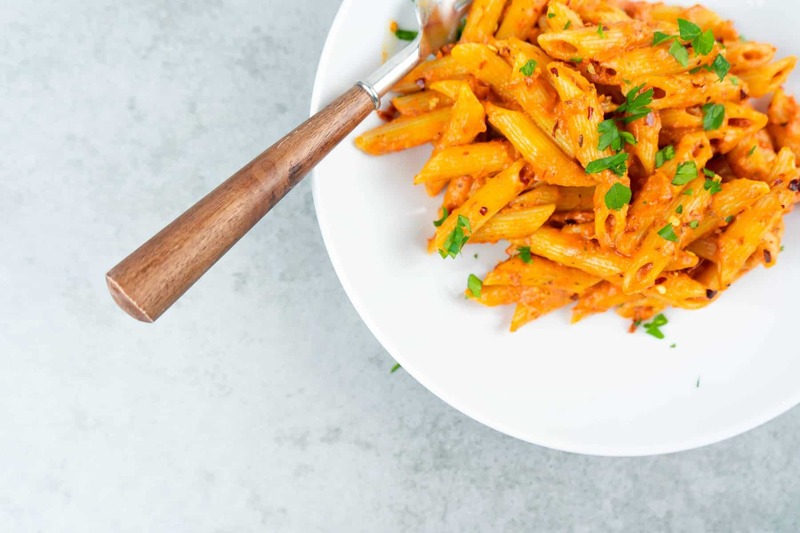 Quality olive oil, good crushed tomatoes (big fan of Muir Glen or Tuttorosso) and good penne (I’m a Barilla girl through and through) all make this dish perfect without much effort on your part. AKA: the best sort of dish! 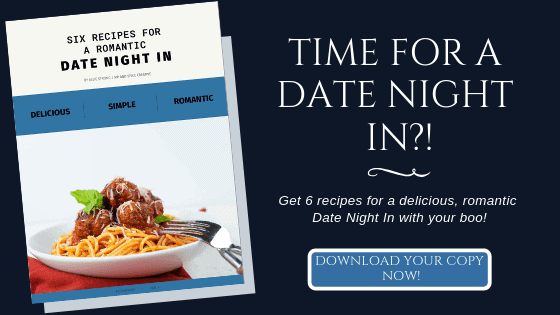 You’ll notice that this dish is perfectly sized for two, just in time for date night, but it’s easily expandable! Make a whole pound of pasta with a whole 28 oz. can of crushed tomatoes for a family or when you have company over. Or even more for a party. I will say, Penne alla Vodka leftovers are always a good idea. If you’re into that sort of thing. In a large saute pan, heat the olive oil over medium heat. Add the crushed garlic and red pepper flakes. Cook for 2 minutes until fragrant. Add the crushed tomatoes, Italian seasoning, salt and pepper and stir well. Let simmer for 15 minutes. Add in the cooked pasta and stir. Add the vodka and let cook for another minute. Pour in the heavy cream, stir well and let cook for 5 minutes. Remove from the heat and serve with a sprinkle of parsley on top.